Reading Between the Wines Book Club: #BookReview: The Shadow Prince by Stacey O'Neale - 3.5 Wine Glasses! #BookReview: The Shadow Prince by Stacey O'Neale - 3.5 Wine Glasses! 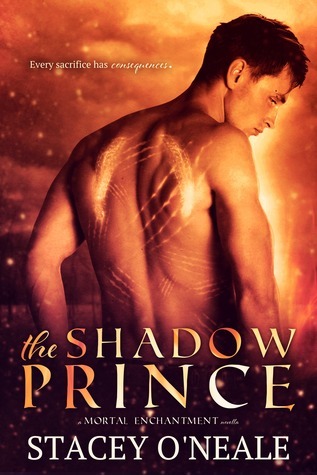 The Shadow Prince is a fast-paced prequel novella to Stacey O'Neale's new Mortal Enchantment series. It is currently available as a free eBook from major retailers including Amazon, B&N and Smashwords. While it is just a 76-page read that introduces the world and characters that will be featured in the upcoming series, there's also a lot of action and emotion packed within the pages. The story is told from the POV of Prince Rowan, a fire elemental, the only son of Queen Prisma. The Queen has summoned Rowan to court as she has surprisingly decided to abdicate her throne and to designate Rowan as her successor. The Queen gives Rowan a final challenge: He must kill Kalin, a young halfling daughter of kindly King Taron of the air court. Rowan is horrified and caught in a no-win situation. Can he ignore his moral compass and the negotiated tenets of their world to kill an innocent for the greater good? Knowing his mother, Rowan is aware that failure to follow through will have horrifying ramifications. Prince Rowan is just 16 years old and mature beyond his years. He is honest, loyal, methodical, open and caring. We meet Kalin primarily through Rowan's eyes, but she appears to be sweet and innocent with attributes I'd associate with a typical teenager. According to the sneak peak of Mortal Enchantment included with this prequel, Kalin will feature prominently in the next book. I was disappointed that Marcus, Rowan's best friend, deserted him at a critical time, but I can understand why he would do so and I would assume that he will return in the future. Queen Prisma has to win the prize as the cruelest monarch and the most heartless mother ever. She is cold-blooded, callous and sadistic beyond words and I didn't like her in the least. The world O'Neale created was incredible. The author's writing was top-notch. The story was gripping, and edgy. There was no romance within The Shadow Prince, but I have a feeling that will change in Mortal Enchantment. I was not entirely happy with the book due to the extremely dark theme, but I was riveted to the tale from the beginning to the end. This is an intensely emotional fantasy acceptable for a new adult audience. I would be hesitant to recommend it to very young adults as a few scenes were disturbingly graphic that left me teary-eyed . Bottom line: The Shadow Prince is a well-written, engrossing story with an intense plot. It delves into moral dilemmas and life-changing decisions that play out as real and logical. It renders a lot of insight of what's to come in the series. The Shadow Prince ends with a cliffhanger. Thank goodness, Mortal Enchantment became available May 5th. I want to see how this story proceeds. I grabbed this one a while back and it sounds like my thing. Love the dark theme myself. Thanks for the review!